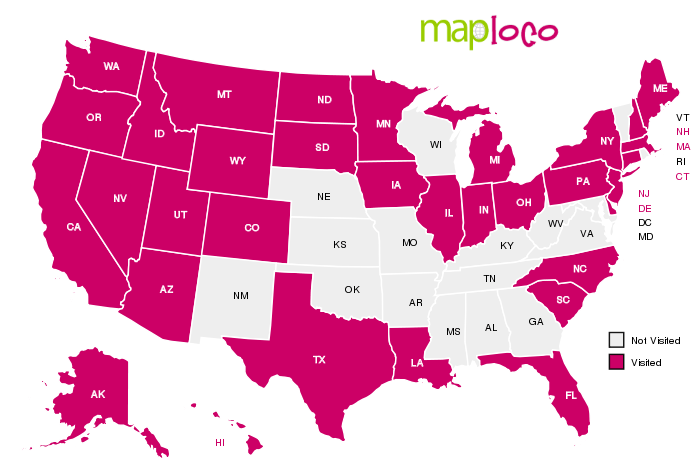 Finally we make landfall in North America, not in Halifax as per the schedule, but New York or the Big Apple. Another relaxing sea day culminated in the three hour transit from the pilot station to our berth in Manhattan, followed by US Immigration, which was a five hour marathon. Although our meeting with immigration was barely a couple of minutes, only about 20 passengers are USA or Canada, so the remainder had to go through the finger prints and photograph routine, which take considerably longer. 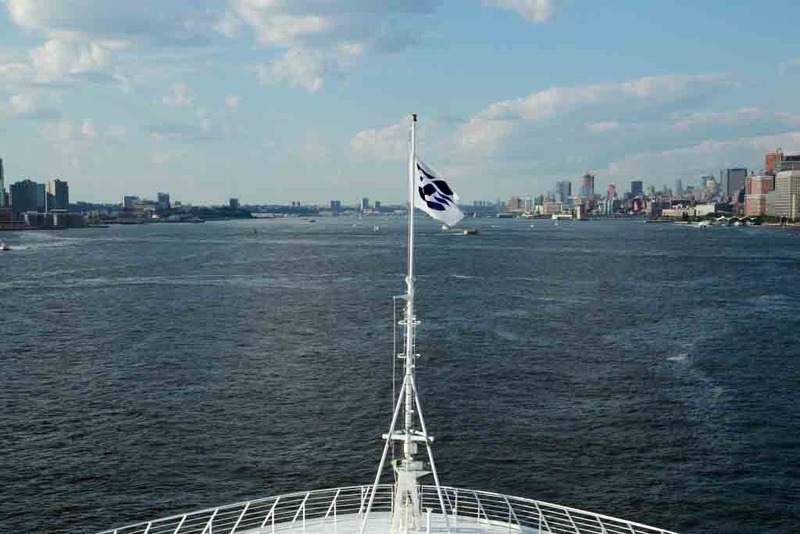 Throughout the early hours of the morning Sea Princess maintained W’ly courses, at about 20.3 knots, towards the New York pilot station. About 09:30 the Captain advised they were briefly slowing down to 10 kts while they completed the mandatory propulsion and steering tests, prior to arrival in American waters. 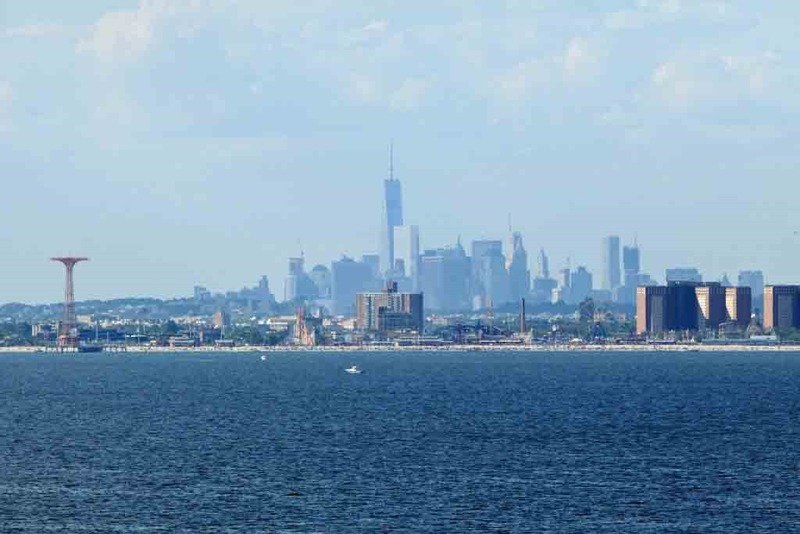 At 16:15 the pilots boarded and we commenced the transit through the buoyed channel towards the Verrazano Narrows Bridge, which we passed under about 17:15. 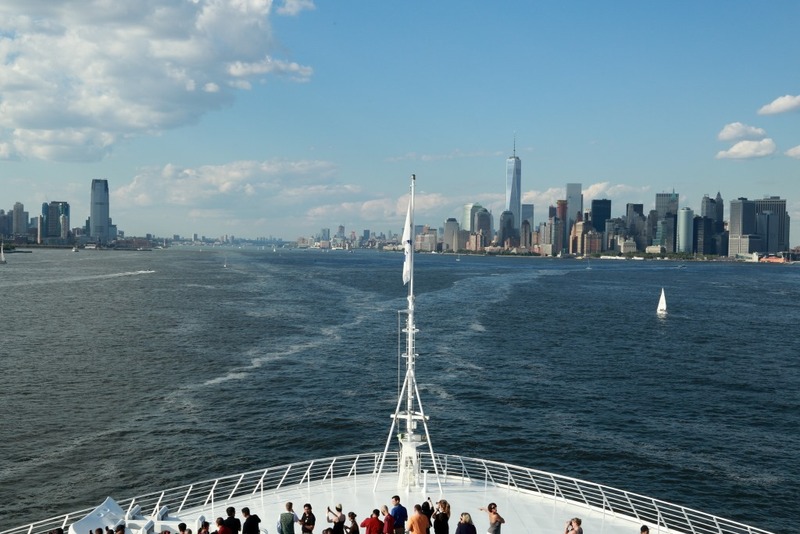 We navigated between Brooklyn and Staten Island before passing the Statue of Liberty and then into the Hudson River to our berth at Pier 90. 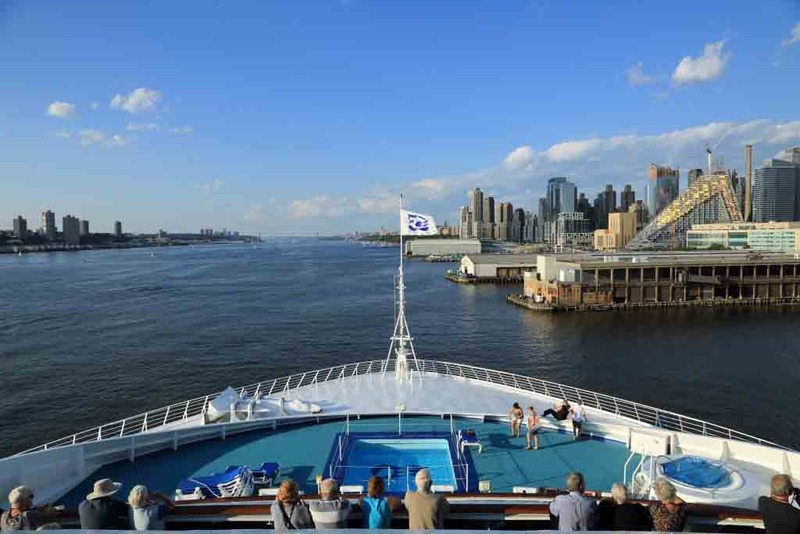 I arrived on the Promenade Deck about 05:30 this morning, completing 18 laps or 6 miles before heading back to the cabin to work on blog posts and photographs. Once Judi was awake we headed down to the dining room for breakfast, which was excellent. My porridge actually had steam rising, as it was piping hot and Judi’s pancakes were hot off the grill and still hot. We thought it the best breakfast since joining the ship, but others at the table complained about slow service. Personally, to get hot food, we are happy sitting and chatting, not like we have anywhere else to go. The schedule this morning was compressed, so Zumba was a 30 minute session, with a little more intensity, which certainly worked up a sweat. Next up was the Culinary Demonstration with the dynamic duo of Chef and Maitre D. Having watched the Chocolate Demo with the Pastry Chef teaching the Executive Chef, we figured we didn’t need to watch the Maitre D teaching the Chef, so we gave this one a rain check. Next up for me was David Russell’s final lecture titled, “Operation Pedestal 1942 – The Convoy that Saved Malta”. Yet another lecture where David added some personal touches, as he lived in Malta for many years, while his dad worked on the base. He started with the history of Malta, highlighting both its remote location and its strategic importance being almost equidistance to Britain’s major bases in Egypt and Gibraltar. The Germans started bombing Malta, which in 6 months received more bombs than London, during the entire war, and decimating the supply convoys to try and starve them into surrender. Winston Churchill famously stated they will re-supply Malta and keep her under British control, at all costs. Therefore, a fast and heavily defended convoy departed UK for Malta, but on entering the Mediterranean it was subjected to almost continuous attack. They lost about 75 of the merchant ships and a few escorts, including one of the carriers. However, 4 merchant ships arrived in Malta, including the tanker, which had to be towed for the final day. Nothing else was of interest on the schedule, so we chilled on the balcony until heading out on Deck 11 forward to watch the arrival. The pilot was due at 16:15, so we were out before 16:00 to get a spot at the railing for the best view and photographs. Unfortunately the light and haze wasn’t conducive to the longer range photographs. 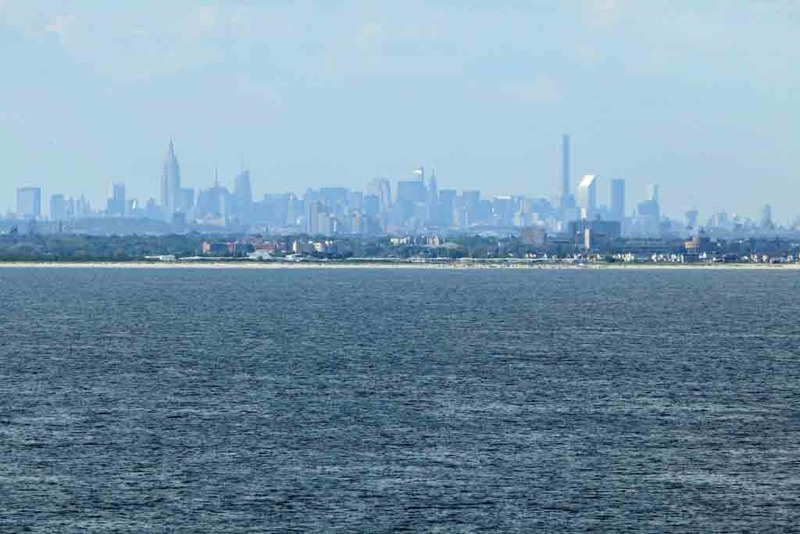 First glimpse of New York with the Long Island shoreline and Manhattan in the background, as we were still out at the pilot station. 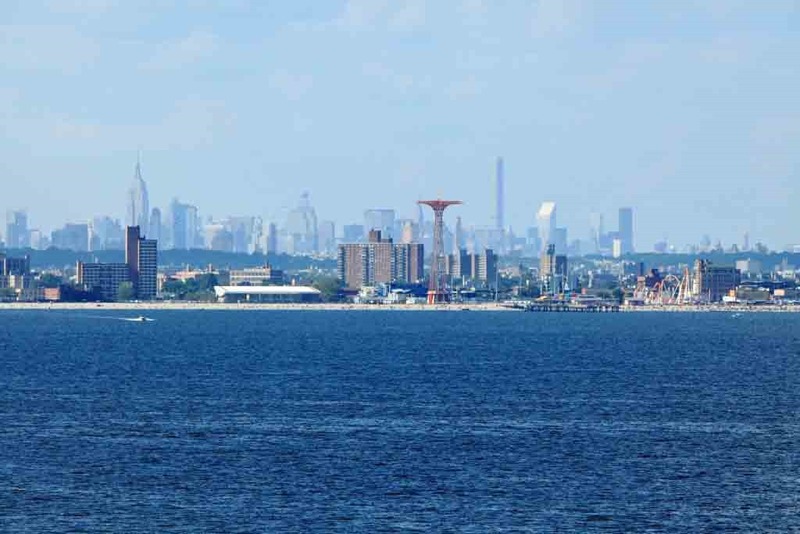 Coney Island Tower and amusements in the foreground and Manhattan in the background. 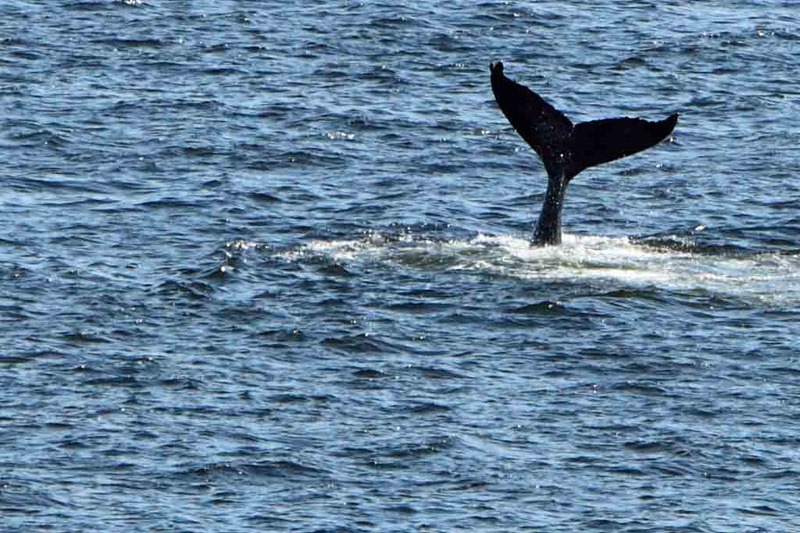 Our first sighting of wildlife, looks like a young whale who was slapping the tail fin. This was captured while approaching the pilot station and initially popped up on the port beam, so from my position in the middle of the fwd deck I only got 1 photograph. Coney Island Tower and amusements from closer to Verrazano Narrows Bridge. 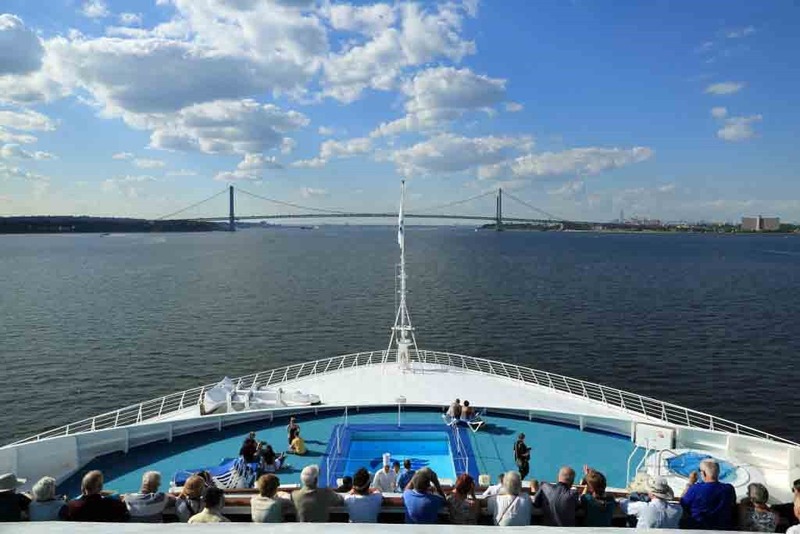 Navigating along the buoyed channel and just turned the bend onto the final approach to the Verrazano Narrows Bridge. Approaching Verrazano Narrows Bridge with Stem Jack holding up the bridge. Looking up New York/New Jersey Harbour after passing underneath the Verrazano Narrows Bridge. 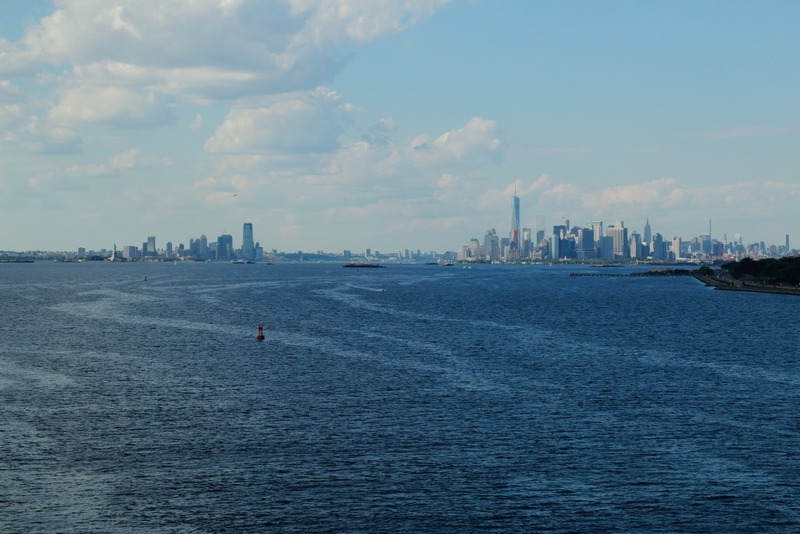 The immediate right is the edge of Brooklyn and ahead is Manhattan to the right and New Jersey to the left. 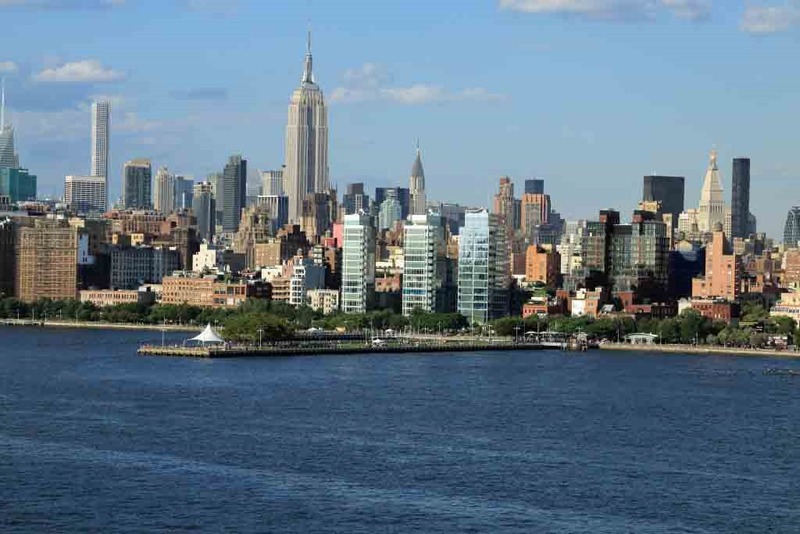 The water between Brooklyn and Manhattan is the entrance to the East River, which flows down the East side of Manhattan. 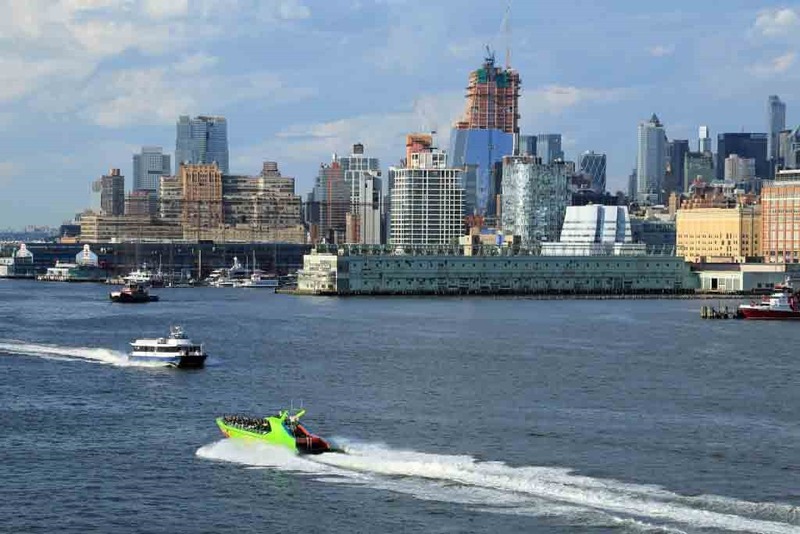 Directly ahead is the entrance to the Hudson River, which is the boundary between the 2 states New York and New Jersey. Approaching the entrance to the Hudson River, the remnants of ship wakes visible ahead of us provides an indication of how busy these waters are with marine traffic. The wake heading to the right, or the East River was from one of the Staten Island Ferries. We followed the one to the left and up towards the entrance to the Hudson River. 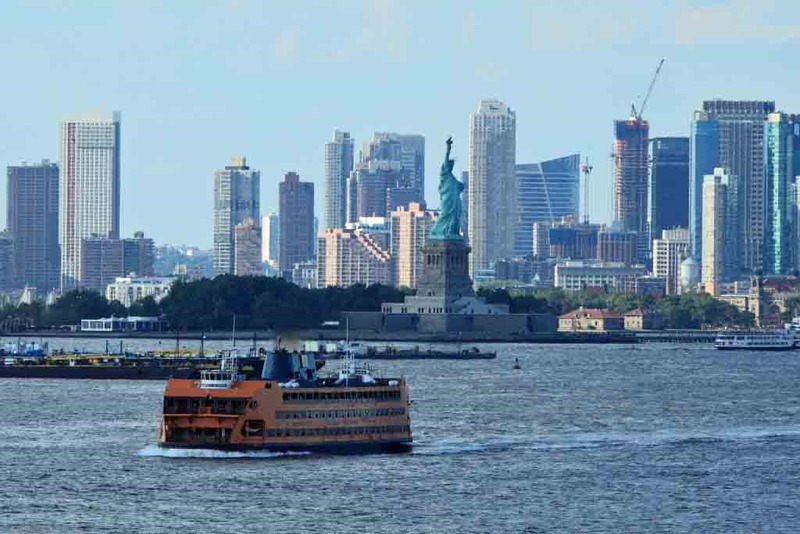 One of the Staten Island Ferries that provide a free service from Manhattan to Staten Island, with Lady Liberty in the background. 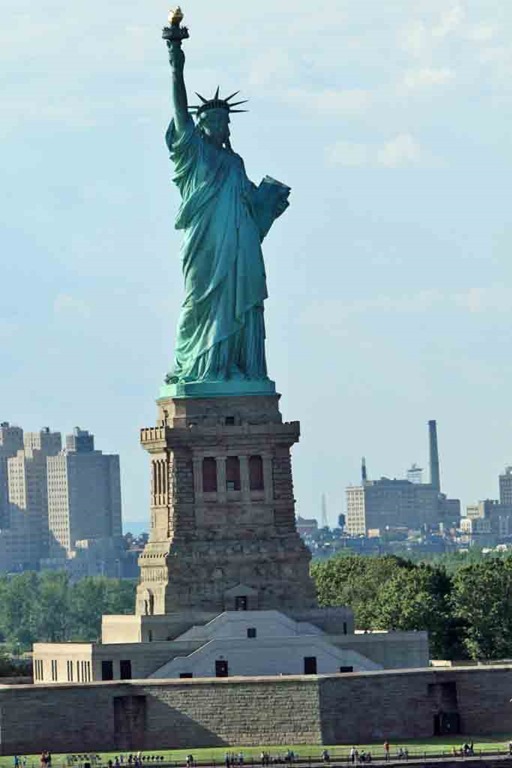 Statue of Liberty, which is actually on the New Jersey side of the harbour. 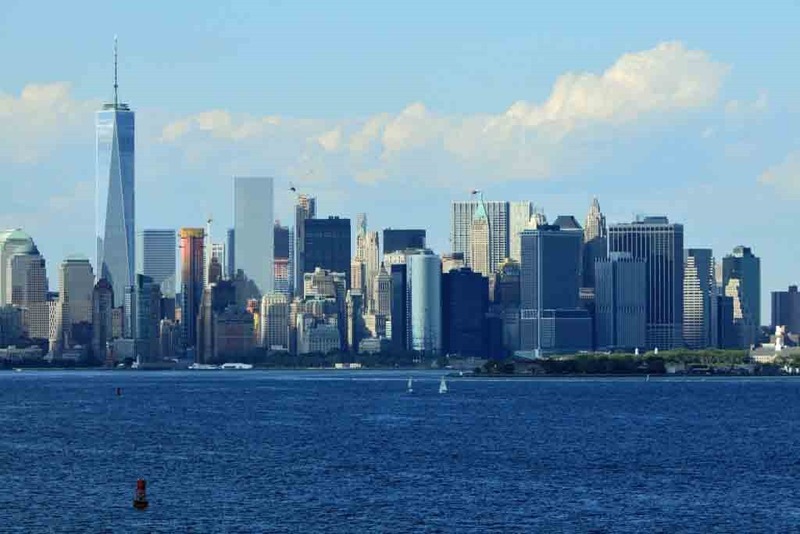 First shot of Manhattan’s south end with the new Freedom Tower, or One World Trade Centre to the left side. 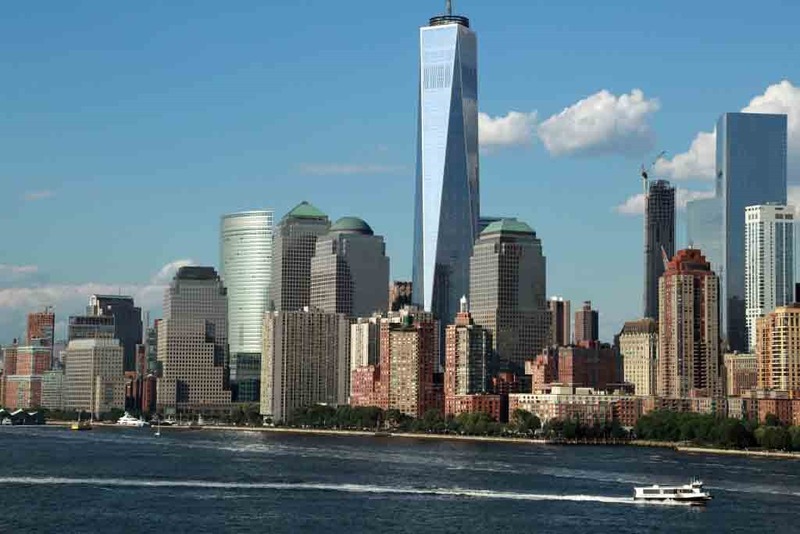 This is the new tower built adjacent to the location of the original twin towers of the trade centre. As we turned towards the Hudson River this shot captures the south end of Manhattan Island and the East River and Brooklyn Bridge. Entering the Hudson River for our transit up to Pier 90, which was about half way up Manhattan Island. This is a busy waterway, with lots of commercial vessels and sailboats, sightseeing boats and even kayaks. 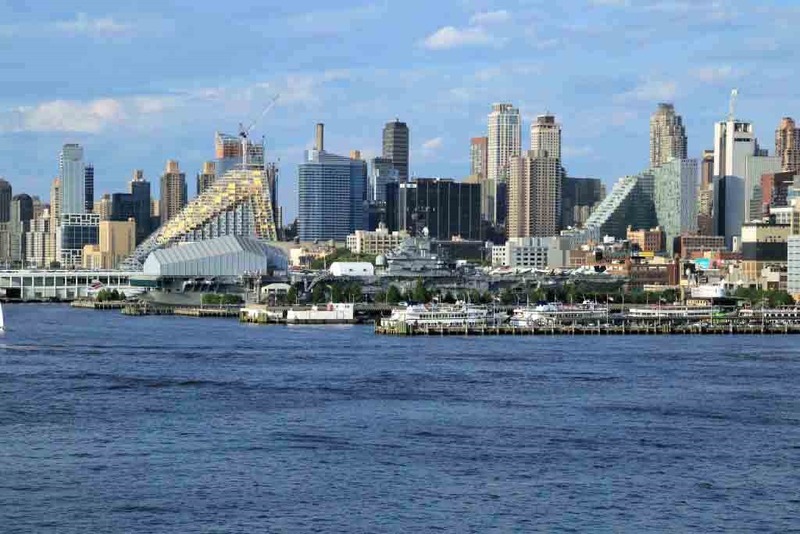 South end of Manhattan Island as we enter the Hudson River. 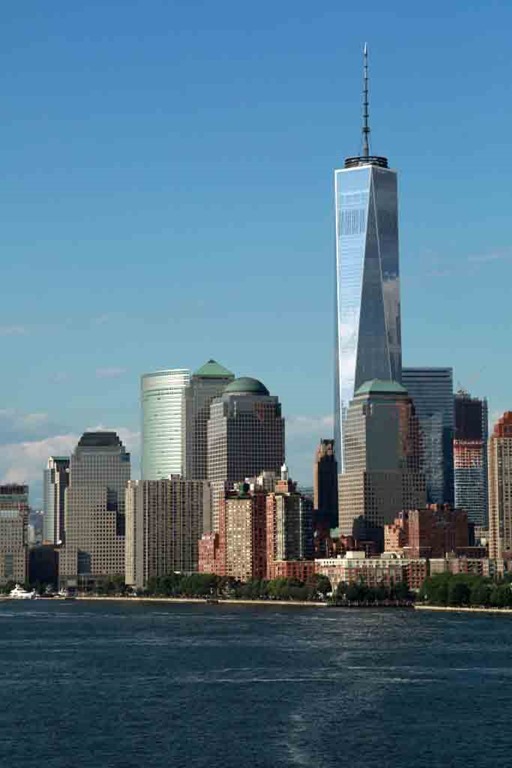 Freedom Tower or One World Trade Centre, which we will visit tomorrow and spend time up on the observation deck. 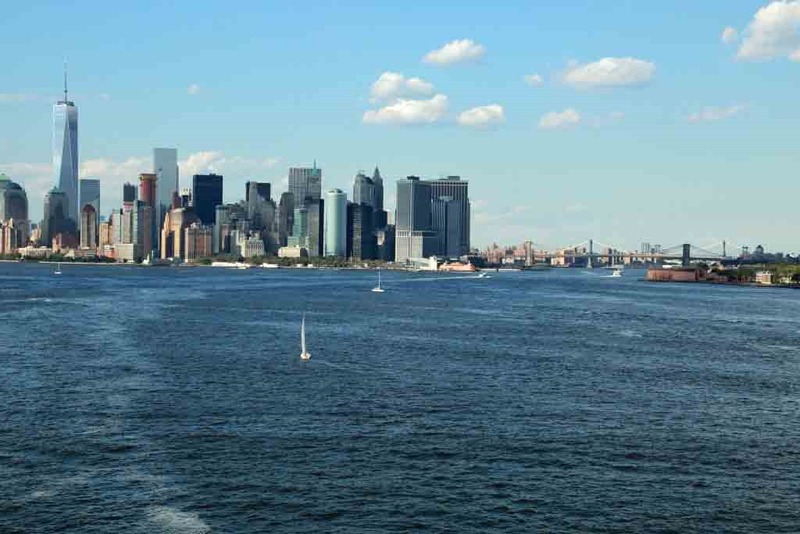 Proceeding up the Hudson River with Manhattan on the right and New Jersey on the left. South Manhattan Island skyline as we sail up the Hudson River. The exclusive area of mid Manhattan known as Chelsea, which was named after the equally exclusive area in London. Rents and purchase prices are astronomical in this area. 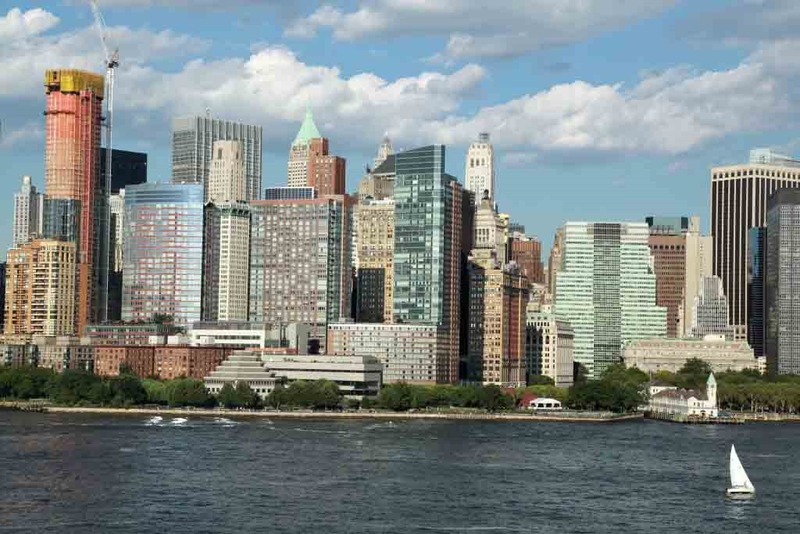 Rent are about $5,000/mo and purchase prices from $2 – 10 Million for an apartment. Some of the old piers, which are now used for various sporting activities – golf, football, trapeze school, sailing, etc. Approaching our berth at Pier 90, which is just passed the aircraft carrier USS Intrepid. 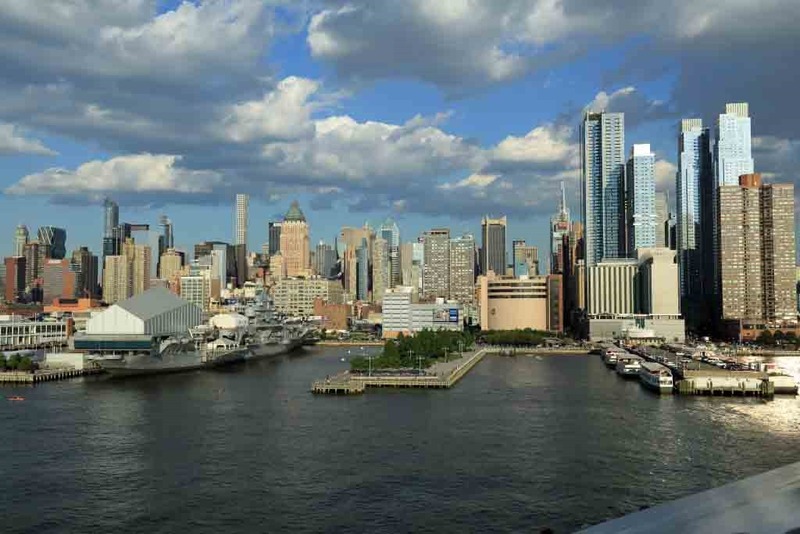 Manhattan skyline in the vicinity of our berth and passing the USS Intrepid aircraft carrier museum that also has a shuttle, concord and a submarine. Looking up the Hudson River approaching our berth at Pier 90. Once alongside, Judi and I headed up to the buffet for dinner before attending the US Immigration sojourn. Dinner was actually fabulous, one of the few meals where everything was piping hot and tasty. Must have been a special effort in case they received a US CDC Inspection. After dinner we headed back to the cabin to await the Immigration procedure. Yet again the Purser’s Department tried their best to make this mandatory event as painless as possible for the passengers. In addition to the mandatory meeting with US Border Services ashore, nobody can re-board the ship until all passengers have completed the immigration, which is estimated to take from 4 to 5 hours. 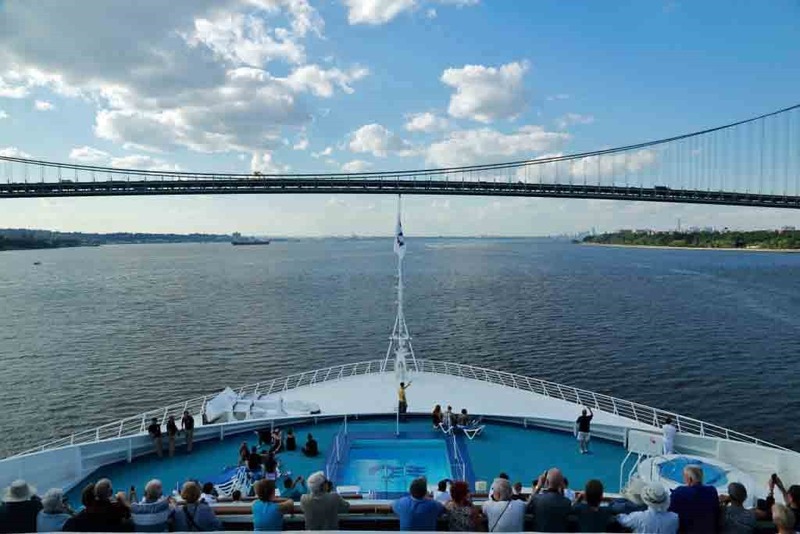 Normally the cruises have about 75% U.S. and Canadians, who don’t require the finger prints and photographs, but on this ship we only have about 20 U.S. and Canadians, so almost everyone requires their finger prints and photo, which slows the process. Therefore a strategy is required and this was well explained by the ship’s officers. If heading ashore for the evening they suggested getting an early number and if returning to the ship remain aboard and collect a later number. We chilled in the cabin until 21:30, at which time we headed down to the Vista Lounge. After a brief wait outside the lounge we received tickets for the end of group 18 out of 25. Each group was called sequentially, so we sat in the lounge for about 45 minutes before heading ashore. Again a short delay ashore and we met with a border agent for a couple of minutes, while he scanned and stamped our passports. After that we had to sit in the terminal on really uncomfortable chairs in a really hot and humid terminal, without any wi-fi. Yet again the ship tried to minimise the inconvenience and provided water, juice and trays of biscuits. About midnight, all passengers were either ashore or in the Vista Lounge awaiting to head ashore, so the ship received permission to commence re-boarding. This was again well organised and was completed by groups, starting with the lowest numbers. It initially started with only 1 gangway, but when all pax were ashore from Vista they opened the 2nd gangway for boarding. We were back in the cabin by 00:30, so the entire process took us about 3 hours. 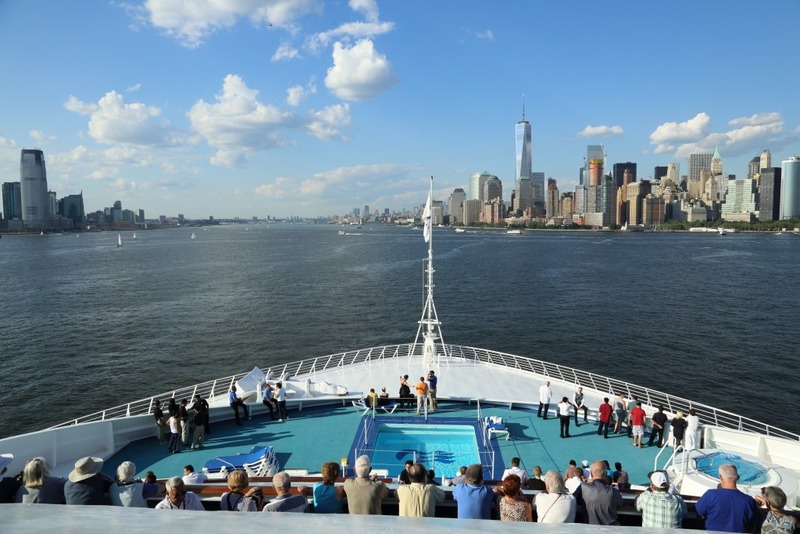 This entry was posted in Cruise Days, New York and tagged 2015 World Cruise, Freedom Building, Manhattan, New York, sea princess, Staten Island Ferry, Statue of Liberty by oriana77. Bookmark the permalink. Super photos of the sail-in! This was truly a treat. Glad you enjoyed them. On checking yesterday I was rather disappointed with the quality loss due to high compression. Unfortunately with the satellite speed and cost, it was necessary.